Starlight Collection by OPI brings a constellation of color to nails and toes for Holiday 2015. This new collection of 18 limited-edition nail lacquers and GelColors sends style into the stratosphere with hues as glittery as the night sky, as deep as space itself, and as riveting as a romance written in the stars. Beauty and technology collide to stellar effect in Starlight Collection by OPI. New shades, finishes and textures fire the imagination and transport the wearer to unexplored worlds. “From rich jewel tones and unearthly metallics to spectacular glitters and celebratory confettis, we love these shades and textures to the moon and back,” adds Weiss-Fischmann, who notes that the collection also includes Swarovski crystal and metallic embellishments to inspire nail art worthy of any holiday soiree. Love is in My Cards - This warm, romantic red is destined for me. Ro-Man-ce on the Moon - Rendezvous in the glow of this lustrous, rich red. Guys & Galaxies - This maroon beauty makes my world go ‘round. Let Your Love Shine - Show it off in shimmery, red splendor! I’m in the Moon for Love - Simply because I’m wearing this plum. Cosmo with a Twist - Subtle sparkle adds depth to this purple. Give Me Space - Night-sky blue with room to sparkle. Center of the You-niverse - Endless space black shimmer. No More Mr. Night Sky - An assertive, dark shimmery gray. Super Star Status - A spotlight-stealing silver and gold glitter. I Drive a SuperNova - Hitch a ride on this lustrous sterling silver. By the Light of the Moon - Silvery and sparkly…prepare to swoon. Comet Closer - May I take this warm, textured gold? Is this Star Taken? - Iridescent icicles fly in this smooth gold. Press * for Silver - This warm, rosy silver really calls to me. Infrared-y to Glow - Strike up the glam with red confetti and glitter. Ce-less-tial is More - This pink super-glitter shines with heavenly light. Two Wrongs Don’t Make a Meteorite - This rosy, golden confetti is so right-on! Starlight nail lacquer shades each feature OPI’s exclusive ProWideTM Brush for the ultimate application. 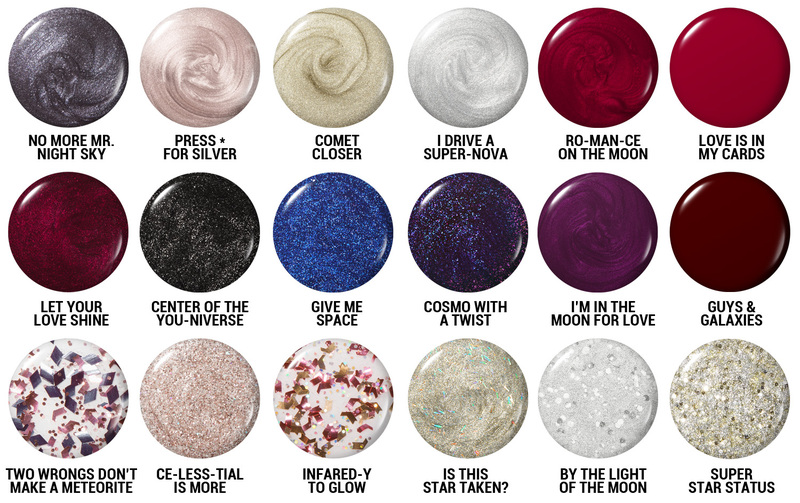 Starlight Collection by OPI will be available in both nail lacquer and GelColor formulas beginning October 2015. Nail lacquers will retail for $9.50 ($11.50 CAN) each at select Professional Salons and retailers including Beauty Brands, beautybrands.com, Chatters, Dillard’s, Regis, ULTA and ulta.com. GelColor is an in-salon, professional service only.